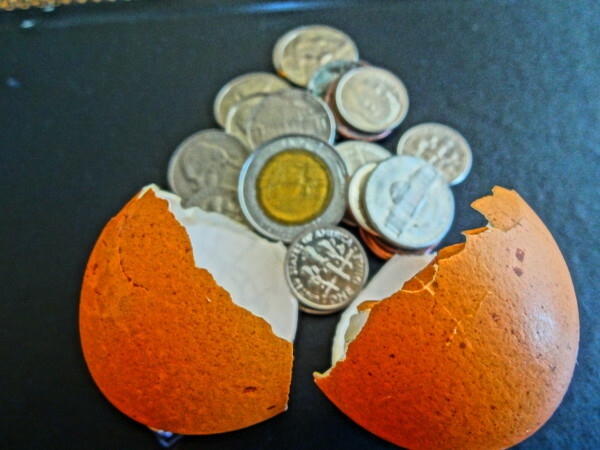 Daily Nugget: Which came first, the Chicken or the Egg full of money? I’m happy to announce the start of a daily post “Daily Nugget” that will feature a photo taken by M.C. Nugget (my beau, for you newbies). Every photo will be offered up by Nuggie, from his mind, and promises to scream everything CHICKEN, and RAPPER… like no other posts can. I’d love to say this inaugural image is one for the Who’s Who of America book … but it’s more of a What’s What… and it begs the question: What came first, the chicken, or the egg full of money? I dare you to answer.